In the wake of Disclosure’s success in bringing house music to the top of the charts, as well as to the dancefloors and iPods across the country, their particular brand of music has been almost inescapable. Countless copycat acts have emerged from the underground woodwork, showing off the same type of funky dance music that London’s top duo have helped popularise. 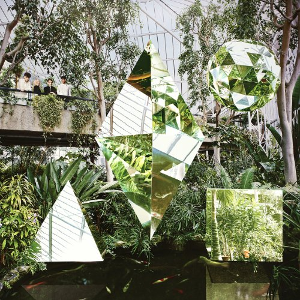 Clean Bandit fall into this category, but provide their own unique twist on the genre. The quartet, who met each other at university in Cambridge, mix in classical music as well as more Caribbean R ‘n B elements to make their songs stand out. They’ve had some big success in the charts so far, and their debut album New Eyes catalogues their best hits so far as well as bringing in some new ones too. It’s a good album, but not without its flaws. I love the sound of Clean Bandit’s songs. They’ve all got memorable beats and basslines that carry through the tracks and manage to worm themselves into your mind and repeat all day. The classical elements in their songs, when they throw in the odd bit of Mozart or Dvorak, adds a distinctive flavour to them but doesn’t feel too tacked on. This album’s got character in spades. The highlights of the album are where they show their poppy side, as you’ll be aware of from their recent singles, with the darker and more intricate songs not coming off quite as well. Their latest single “Extraordinary” is a perfect summer tune, being sunny and upbeat and with impressive vocals from schoolgirl Sharna Bass. “Rather Be” was perhaps one of the best number one hits of the year, with the powerful Jess Glynne giving a brilliant performance that fits a sing-along just as much as it does the dancefloor. My favourite song might be “Dust Clears”, which starts off slow and sedate before coming in with some violin and thick bass riffs to let the tune take off. The clash in vocal styles between Noonie Bao and Grace Chatto also make the song standout more. But Clean Bandit aren’t all about the more commercial side of house, serving up a slice of underground R ‘n B inspired tracks too. “A + E” is more of a disco groove, with steel drums and a slow beat taking its time to warm up. “Come Over” turns up the Jamaican influence with a much more reggae-influenced sound with steel drums aplenty. R ‘n B is not really my sort of music, but I can still admit that these songs sound pretty good. “Cologne” might be the best fusion of both the types of song on the album, and I wouldn’t be surprised if it was Clean Bandit’s next single. What detracts from this album is that some songs try to take on a little too much. The opening track “Mozart’s House” is perhaps the band’s manifesto, giving an emphatic answer to its’ own question: “So you think electronic music is boring?” It’s certainly not dull, but what follows is three minutes of the band cramming in as many elements of their sound as possible, with little organisation or flow. Title track “New Eyes” is similarly all over the place, with a fast rap that’s incomprehensible overtaking a song that starts off mellow. When looking at the album as a whole, there’s no real discernable theme – just a set of tracks that showcase what Clean Bandit can do. While some of the tracks are really top-notch, the album as a whole doesn’t really add up to any more than the sum of its parts. Clean Bandit will hopefully not be a one-album wonder to have emerged from Disclosure’s shadow. They can put together some great beats and have some song ideas that are refreshing and new. New Eyes shows a more eclectic side of house music and proves that the genre and the band have potential, if they can be a little more focussed. I was never in any doubt, but New Eyes proves that electronic music is far from boring.